September 21, 2016 / Liz Nance / Comments Off on Why Fear Big Beer? There are always going to be big guys and bullies. There is always going to be competition and challenge. Why fear it? They started small, or smaller, like you. They chose their path, as small breweries will have to do as natural growth occurs. Big beer has always been there, why fear it now? Is it because they are buying us out? But, some of us are selling. Is it because they appear to be bullies? We know how to deal with those guys on the playground……don’t we? What do we do? To consumers, craft beer lovers, and small business supporters, I say this: continue to buy local craft brews! Buy them from small breweries, gas stations, grocery stores, and bottle shops. Order them at bars and restaurants, and if your favorite spot doesn’t carry them, ask! To taproom, bar, and restaurant owners: buy local craft beers! Support your local and regional economies. 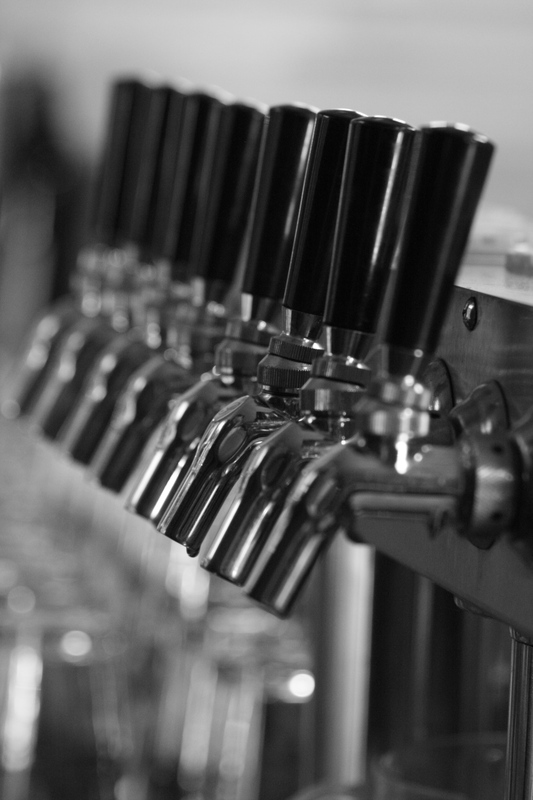 There are small craft breweries all over the U.S. and the numbers are growing. To brewers and brewery owners: Keep on being awesome people in a world of bullies. Keep on brewing. Keep on coming up with fresh ideas and reinventing old favorites. Keep giving your distributers a reason to push your product. After all, when you make a tasty brew that sells itself, no incentives are needed. Last month my husband AJ and I attended the opening of New Belgium’s taproom in the River Arts District of Asheville, NC. It was Tuesday, May 2nd and even though it was a weekday, I knew everyone was looking forward to this so I wasn’t surprised by the turnout. We visited in the mid-afternoon and while the place was packed, the open layout kept it comfortable. The sign at the door told us they loved us and when we entered the taproom, we really felt the love. The folks on staff were grooving and did an awesome job keeping up with the masses. Table and bar service alike were excellent. There seemed to be no first day hiccups. I was thrown off by there being no place to leave tips, not on the card and not in a jar. Then I remembered that New Belgium is an employee owned company. That was the only logical explanation I could come up with. It also helped me realize why everyone was in such high spirits. This is more than just a job to them. It is their life. They care about the company and the company cares about them. To the consumers this translates to happy, knowledgeable, and caring bartenders serving up a quality product. Serving up something to be proud of. We enjoyed our beers in the grassy yard next to the taproom. The porch was full and the sun was out, but we were the first to brave sitting in the new, thick grass. Soon others followed suit. We all watched as, in the distance, the brewery’s production facility was being finished. Enjoying craft brew and watching a brewery come together. I love that feeling. Deciding to stay true to what I like, I had the Citradelic Tangerine IPA. Aj ordered the Botanical Imperial IPA. Both were tasty. Aj’s beer had a nice spicy, citrus flavor and aroma. Glad he went with one we hadn’t tasted. I almost ventured into the watermelon lime beer, but decided against it. Although, it does seem intriguing. Maybe I should have…..
New Belgium Brewing has done well, not just for themselves, but for the communities surrounding their breweries. I’m sure I’m not the only one who is glad they chose Asheville as their second home. And they chose a beautiful spot too! A nice place along the river. You can see the artwork from businesses on the other shore from the deck. While the landscaping was mostly still under construction around the brewery and taproom, you could tell a lot of thought and concern were going into the planting and planning of watershed areas. We are excited to come back with friends and tour the facility. We are also looking forward to future events and releases. Thanks for having us! Pearl Bottom Radio entertaining the crowd. This weekend I was in my old hometown of Griffin, GA and had the pleasure of attending the Doc Holliday Beer, Wine, and Arts Festival. First, I must say that I was happy to see that the town I left has some progressive thinkers and that festivals like these are happening. While it was small and humble, it lacked for nothing. There were great beers , fine wines, and even finer works of art. The stage hosted some very talented local musicians. Ice cold bottles of water were free for the taking and the same tent was offering free breathalyzers to make sure everyone was good to go. The Grazing Here food truck was on site serving up a tasty lunch. The set-up was orderly and the people were friendly. Even the local law enforcement helping with gates and road closings seemed to be enjoying the crowd. The ticket price was more reasonable than I expected. While early-bird and VIP passes are available, I paid the general admission price of $10 which got me through the gates with my own commemorative pint glass. I was then able to purchase tickets for beer tastings. They were $1 per 3 oz pour, which was cool. If you really liked a beer, you just cashed in four tickets and to get a full 12 oz pour. I tried lots of GA beers,however there was craft brew from all over being poured. I tasted the Fixin’ To Session IPA from Jekyll Brewing, the Cadence Belgian Ale from Reformation Brewing, and the Cannon Dragger from Burnt Hickory Brewing. I also enjoyed sampling beers from Monday Night Brew, Jailhouse Brewing, Wild Heaven and Creature Comforts. Georgia has a lot to offer in the way of craft beer. The scene is growing. I am happy that my home state is producing some tasty brews. Now for the coolest part? Doc Holliday Beer, Wine, & Art Festival is used as a way to raise money for various local charities. This year the proceeds went to Camp Southern Ground, a camp that allows children to “overcome academic, social and emotional difficulties so they may reach their full potential and provide the tools necessary to achieve excellence in all facets of their lives”. Sounds like a worthy cause to us. I am looking forward to attending this festival again next year. The beer and people were too good not to want more. Festivals aren’t easy. A lot of behind the scene stuff goes on before the fun begins and the work doesn’t stop when the gates close. Thanks to all of the dedicated people who made this happen. I was glad to be a part of it. Cheers! In Bryson City, North Carolina, Anthony’s Pizza has always been a popular place for locals and tourists alike. I mean, who doesn’t love a New York style pizza? Plus, you can get a pie to-go and walk two doors down to enjoy it at Nantahala Brewing Company. Now you don’t have to leave to get a good beverage. Last year, on top of an amazing makeover of the restaurant, they added a separate bar and lounge for the grown-ups. Dubbed Derailed, this lounge offers amazi ng cocktails, wine, and, of course craft beer. Situated just across the street from the depot of The Great Smoky Mountain Railroad, it’s in the hub of town making it a great place to people watch! Plus, the porch is kid and dog friendly and there’s live music on Saturday nights. However, if you’re trying to escape the hustle and bustle, kids and dogs, then step inside and find yourself a cozy corner to hide-away. The lounge area is 21 and up. Seating ranges from bar stools and tables to velvet sofas and leather recliners. I love this environment. A place where everyone can drink together regardless of their choice of beverage. My last stop in found me at the bar enjoying a draft Green Man ESB and laughing with a stranger who was sipping a high dollar glass of wine. Her partner enjoyed a regular ol’ beer and a shot of whiskey. Something for everyone. I always scope out the craft beer bottle list, as their selection rotates. They also have a couple microbrews on tap. We’ve found beers from New Belgium, Green Man, Lazy Hiker, Sierra Nevada, Founders, Natty Greene’s , Brewery Ommegang , and more. So, whether you’re looking to share a cold brew and a hot pizza with friends or enjoy a cocktail all by yourself, this is a great place to check out on your next visit to the mountains. This little town is full of surprises! In February, I was in Asheville alone on a random Tuesday afternoon. Instead of cruising around aimlessly, I decided to check out a new brewery. I pulled up to Bhramari Brewhouse sometime in the very early afternoon. In a town full of parallel spots with parking meters and paying to be in a parking garage a mile from where you need to be, I was happy to discover that they had their own parking lot! A rarity in downtown Asheville. They were just opening and I was greeted kindly by everyone I encountered. I took a seat at the bar. The place was beautiful. I loved the industry meets nature feel, lots of cool metal sculptures placed among warm woods, rocks, and plants. The tables had little landscapes in the middle with rocks and succulents. They also had a wall of plants that made me feel like I was back in Portland. Everything about this place made my senses happy. Even the music selection fit. They only had three of their own beers on tap, but their guest selection was great! Lots of Asheville beers: Hi-Wire, Green Man, Catawba, Asheville Brewing, and Twin Leaf. They even had something from Boojum and Raleigh Brewing. All great North Carolina beers. I started with Bhramari’s three, afterall that’s what I was there for. First the Carolina Common. Not really my style of beer, but it was well executed so I decided to try it infused. They offer a different infusion every couple of days. That day they were forcing the brew through vanilla and coffee beans. The vanilla stood out more than the coffee, but I figured that later in the day the flavor would get stronger. It was still delicious. I ended with a half-pint of their sour, The Good Fight. Not too sweet, not too tart. Slightly malty, very refreshing. I was just about to leave when a friend came in and joined me at the bar. Ian works for Country Malt Group and was there on business checking it all out. He ordered a flight of their beer as well as a flight of their sodas. I hadn’t even thought to try their house-made non-alcoholic drinks. With an offer to share, we sat and sampled together. Wow! I have to say, Bhramari makes a wonderful soda! I enjoyed the Charred Lemongrass Ginger Beer the most, or was it the Thai Coconut? I couldn’t decide. Each soda offered a new, complex surprise for the taste buds. I had just dropped by so I didn’t take a tour, ask a lot of questions, or get any pictures. I will have to make it a point to go back soon. Would love the chance to go back on a brew day and meet the rest of this wonderful crew. Thanks guys and gals! Can’t wait to get back. This winter we visited family in Mt Pleasant, S.C. in order to shake the winter blues. While there we took an afternoon to visit just a couple of South Carolina’s many craft breweries. We started in familiar territory with Palmetto Brewing Company. Having tried several of their beers in bottles we decided to head over to the source. We parked in front of the brewery and walked through the front gate into a large courtyard. When we entered the taproom, Trampled by Turtles was playing overhead. We sat down at the bar and instantly found ourselves in conversation with other visitors, other tourists, looking for the best in craft beer. The couple next to us even recommended other breweries in the southeast region to try, Southern Pines Brewery and Railhouse Brewing. Two new places to visit added to the never ending list of new breweries to try. The bartenders were friendly and knowledgeable. We ordered a flight of four beers: an amber, a California common, a pale, and an Imperial stout. The two that stood the most were the Amber Ale and the Ghost Rider Pale. The Amber Ale is one of their flagship beers. It was very light and easy drinking at 5.4% ABV and 27 IBUs. The Ghost Rider Pale was probably my favorite beer this entire trip. A citrusy American Pale Ale with smoked ghost peppers. I am a huge fan of spicy and this beer had the bite that I love, yet it was mellowed out nicely by the use of cherries. I believe this beer was a limited release, part of their 843 Series. Should have taken more home! Next we drove up to North Charleston and had an interesting time with google maps trying to find our next destination. When we finally found it, we discovered that the view alone was worth the driving around. Freehouse Brewery is in an old building along a stretch of railroad tracks that makes it look like it used to be a warehouse of some sort. The front yard is a large grassy place next to the Ashley River. There was a woman sitting on a picnic blanket with two small children who waved when we stepped out of the car. Even though the weather is mild, yet warm for this time of year, the porch is full. We make our way inside and realize just how small the brewery is, but obviously it’s not the size that matters. Most, if not all, of their beers use organic ingredients. This is not an easy task for microbreweries as ingredients become more costly and harder to find. However, their prices remained reasonable. We tried six beers. Freehouse had a lot of brave flavor combinations. A favorite was one that I ordered out of sheer curiosity; the Kiwi Blueberry Sourlina. This was a very easy drinking sour ale that was not too complex with a perfect balance of tart and sweet. Would love to visit this place again to see what other bold flavors they can think of. The staff and patrons were both friendly. I even ended up leaving my bag there by accident, when I returned later it hadn’t been touched and the bartender jokingly asked if I could prove that it was mine. South Carolina craft beer is on the rise and we were happy to support these two fine breweries. Next time we’ll have to take some tours. This time was purely for relaxation and beer drinking. Thanks Charleston. See you again soon.